The World's best whitewater rafting! We've been running whitewater rafting trips on the Nile since 2005. Our directors and staff have travelled the world in search of the best whitewater. As a team we have logged thousands of hours on extreme and difficult whitewater. We follow International Rafting Federation guidelines and all our staff are fully certified guides with advanced first aid training. We complete regular training to ensure our entire team stay current and up-to-date with best practice and have a comprehensive safety management plan and insurance. We are passionate about whitewater and we have dedicated our lives to it! 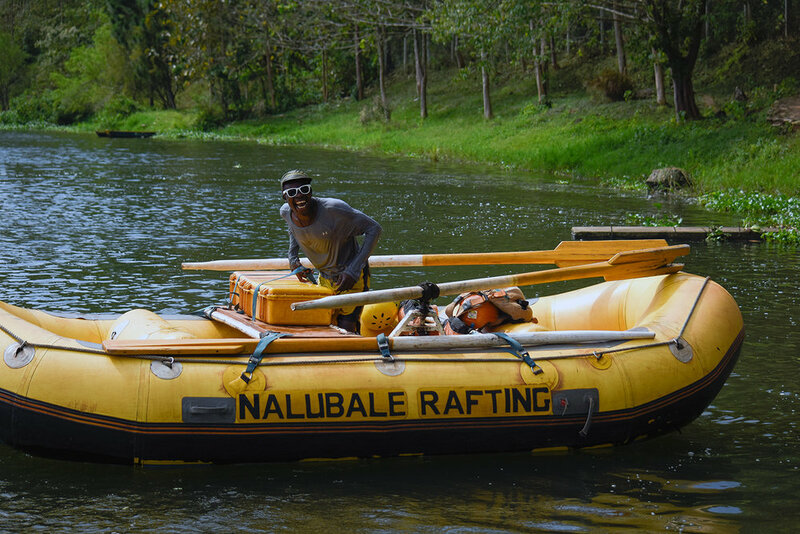 When you book a rafting adventure with Nalubale you are getting the culmination of our experience and passion delivered to you out on the river. We don't just take you rafting, we share our love of the river and our craft with you - we show you our playground, our River - the mighty White Nile. Our motto is 'Safe, Fun Adventures for Everyone'. Safety isn't an afterthought, it is the very first consideration in all our decision making processes. We have a comprehensive Safety Management Plan and 'Safe Operating Procedures' which enable us to operate at the highest international standards. All our staff are wilderness first aid certified, our guides and trip leaders have IRF or equivalent tickets and we undergo regular training to ensure we are always up to date with best practice. All our whitewater trips are accompanied by a safety raft and safety kayakers and carry a comprehensive expedition first aid kit and rescue equipment. If you would like to learn more about our safety procedures please contact us. Whilst we cannot offer bespoke adventures to all our clients everyday (we do afterall have a schedule to keep), we will go out of our way to make sure you get the trip that you want. This means we can offer a mild or extreme trip (even on the same day), we can offer flexibility in our transport pick up locations, and make sure we cater to your dietary needs. If you need advice or help planning or booking any other part of you trip in Uganda we are happy to help. If there is anything at all we can do to help make your rafting experience the best ever, just get in touch! It could be that we serve fresh Artisan Coffee direct from Sipi River Lodge. It could be that we've banned plastic bottles to reduce our environmental impact. It could be that we were the first company to offer FREE photos on all whitewater trips. It could be that we really listen to what you want and always try to deliver a trip that is tailored to your individual needs. It could be all these things and more! It is not by chance that we are Number 1 on trip advisor! We wear that honor with pride, if there's anything you think we can do better please let us know as we continue to try and improve our service!